The Extra Ordinary Life of me: Lose it! - my new favorite App!! Lose it! - my new favorite App!! SO we have an iPod touch and I have been playing with it more lately in contemplating the move from a Blackberry to and iPhone and in the course of doing it I have been looking at apps and have found a few new ones that I really like. I will start that I use my blackberry for many things aside from Phone calls and email. I email myself recipes, use it as my grocery list, my to-do list - you get the idea. The reason why I think I am going to love the iPhone so much is that I can do all of my usual things AND have games. Additionally - when ever I say "gee I wish there was something that did X, Y or Z" I consistently get told "there is an app for that" and well there is. I love that you can create your own food (such as my morning smoothie) and then having there instead of having to reenter the food each time. I LOVE that it is on my iPod and that I can literally take it anywhere with me and add what I am eating to it. While there are some usual downsides (e.g., that it doesn't have every food in it) it is something that was very easily over come. I can see this being a WONDERFUL tool. I know from my experience a couple of years ago the best tool that assisted in my weight loss was journaling. However, it was not something that I could realistically keep up with the method I was using (pen and note book) for long term. This is the perfect replacement!! 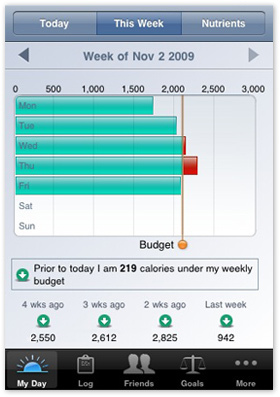 The app was very simple to use - I put it my current weight, my goal weight and how much I wanted to loose each week. It then suggested a daily calorie limit. 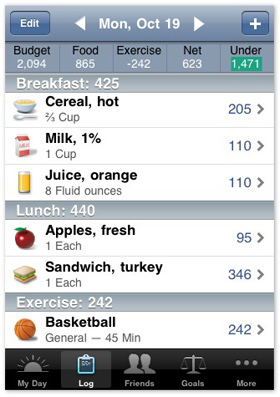 As I entered my daily food intake it would show me how many calories I had left and them take into account how calories I burnt through exercise. I will continue to update as I use it for a longer period. For now, I only put it some test data and then todays information but I must say I love it and highly recommend it!